The Holy month of Ramadan comes again. It is the month for showing our deep love to our heart lovely God. 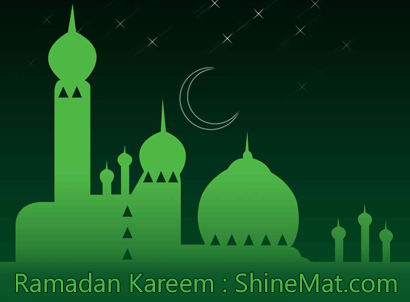 I am wishing and hope this month of Ramadan Kareem filled with joy, pure love and happiness. It is the month of fasting, patience, praying, forgiveness and repenting from sins. Muslims practice fasting not only for satisfying the God, but also for feeling and suffering pains of poor and needy peoples. Ramadan gives us some special things in a year. ● Make us deserving for Allah’s blessings. ● And finally, Eid Ul-Fitr. The last ten days (i.e. 21 no. roza, 22 no. roza …. …. 30 no. roza) comes with blessing and happiness from Allah. Because, it is the time when the Holy Quraan Sharif was revealed to the earth. Oh! 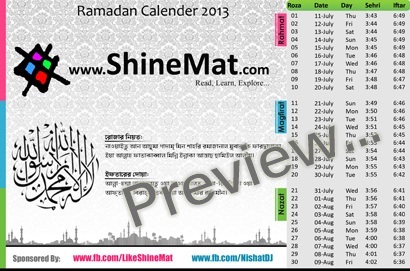 We have published and already distributed printed Ramadan Calendar 2013 powered by ShineMat in our city. If you are from Brahmanbaria, you can download our Ramadan Calendar 2013 for time schedule. Hope this helps. It is request to all of our Muslim readers to complete their Namaz five times in a day regularly. Honestly speaking, sometimes I also miss some prayers, but I always try to complete all. At last, I would like to say may Allah bless us all to take all Roza peacefully. 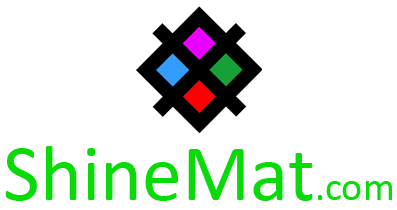 Hope Almighty Allah gives the shower of blessing upon on us and this little blog also.